Experience the beauty of Hendersonville, North Carolina! 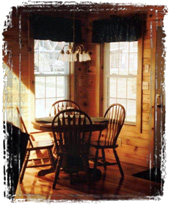 Situated on a hobby farm several minutes out of town, our cabins offer a relaxing get-away for a weekend or comfortable living quarters for a longer stay. Click on the links at the left to view pictures and find out more. Designed and built with all the love in the world by Atlantic Creative Solutions.